German thrash titans KREATOR partnered with Record Store Day to release a Black Friday exclusive. On Friday, November 24th, a limited edition (1,000 copies) of “Hail To The Hordes” on picture disc vinyl was released EXCLUSIVELY at your local indie record stores! In celebration of the release, the band offers a music video for “Hail To The Hordes" which highlights the bands hometown show at Grugahalle in Essen, Germany from last March The video was directed by Matthias Kollek of Vault Video. "Hail To The Hordes" is off the band's 14th album, Gods Of Violence. It was recorded under the watchful eyes of producer Jens Bogren (OPETH, AMON AMARTH, KATATONIA) who also mixed the record at renowned Fascination Street Studios. Mastering was also completed at Fascination Street Studios by Tony Lindgren. 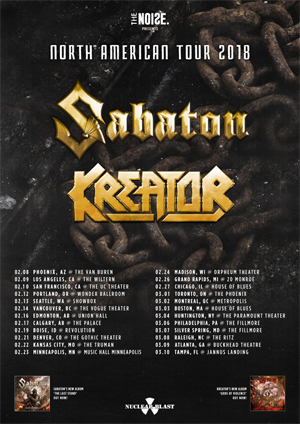 KREATOR is uniting with Swedish heavy metal heroes and label mates SABATON for the ultimate North American co-headlining trek. The 24-date tour kicks off on Thursday, February 8. 2018 at The Van Buren in Phoenix, Arizona and will make stops in Los Angeles, Montreal, and Philadelphia before concluding at Jannus Landing in Tampa, Florida on March 10th. Nuclear Blast's Symphonic and Thrash metal artists collide for an unforgettable experience filled with high energy and extradorniary musicianship. SABATON will be touring in support of their eighth album, The Last Stand. KREATOR is touring in support of Gods Of Violence, which entered the world charts at #16.